We have taken several trips into New York City on this visit with my daughter and her family but now my granddaughter is six we have to take into consideration what will interest her. 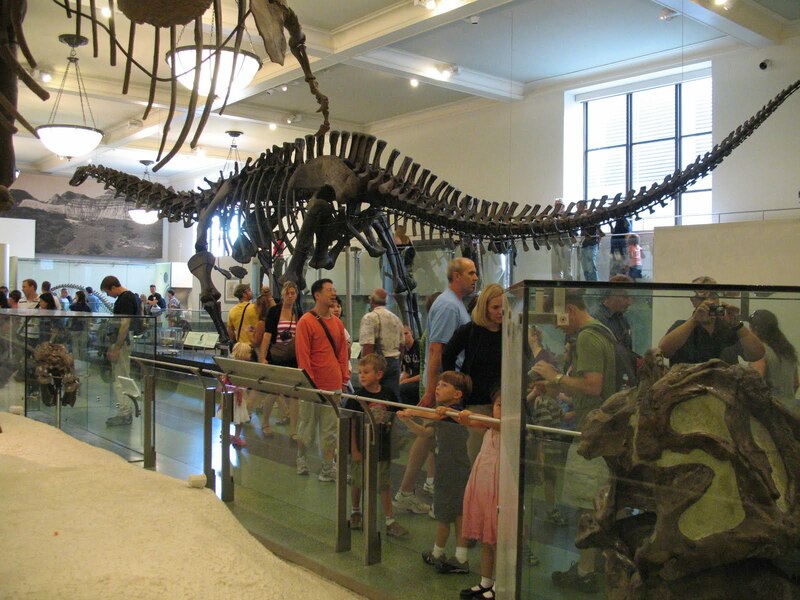 So on one of these we set out to the American Museum of Natural History. The beautiful stone building, which sits on the edge of Central Park, sprawls over several city blocks and is a popular tourist destination as well as a favourite with the locals. 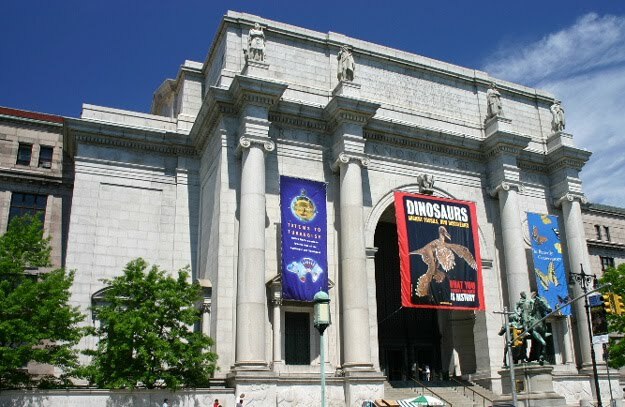 For 125 years, the American Museum of Natural History has been one of the world’s preeminent science and research institutions, renowned for its collections and exhibitions that illuminate millions of years of the earth’s evolution, from the birth of the planet through the present day. It is a huge museum, with four floors of 42 permanent exhibits and usually several special exhibits at any one time and one cannot hope to cover it all in one visit. Fortunately we have been several times already and in fact I think we have covered most of it on one occasion or another. As with some other museums in New York City it has a suggested donation entry fee, in this case $19, but since my son-in-law’s company is a corporate sponsor he is able to get free entry for up to eight people at a time so we only had to pay the incredibly expensive parking fee for the car. Did you know that some parking garages advertise $22 for the first 30 minutes in NYC? 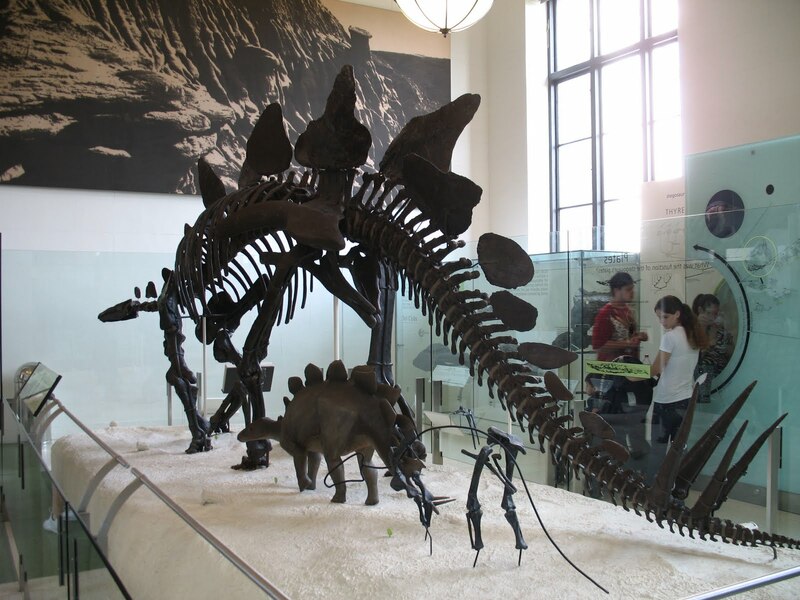 Whenever I see the skeleton above in the museum it brings to mind that scene in the 1938 movie Bringing up Baby, where Katharine Hepburn climbs up the ladder to talk to Cary Grant, who has so labouriously built the dinosaur skeleton and she brings it all tumbling down. The area the youngest member of our party chose for us to visit on this occasion was that which covered the invertebrates from dinosaurs to advanced mammals. Naturally we started in the dinosaur section, which is always a favourite with most children. 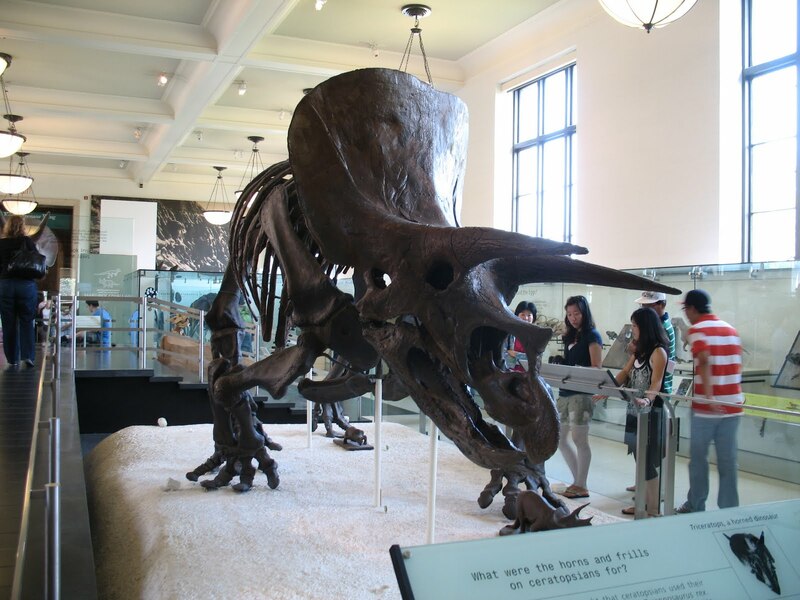 This museum has a fine collection of genuine dinosaur skeletons, including the Tyrannus rex above, and of which only 15 partial specimens have ever been found. They also have the first T. rex skull ever collected. As an aside it seems that all the categories of dinosaurs have been changed since my children were obsessed with these animals. All very confusing. 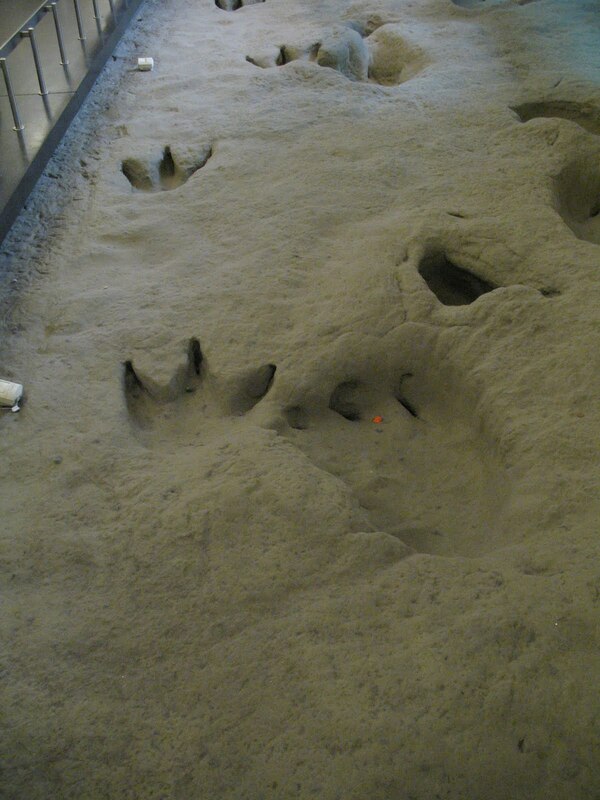 This is part of a dinosaur trackway from the Paluxy River, in Texas. 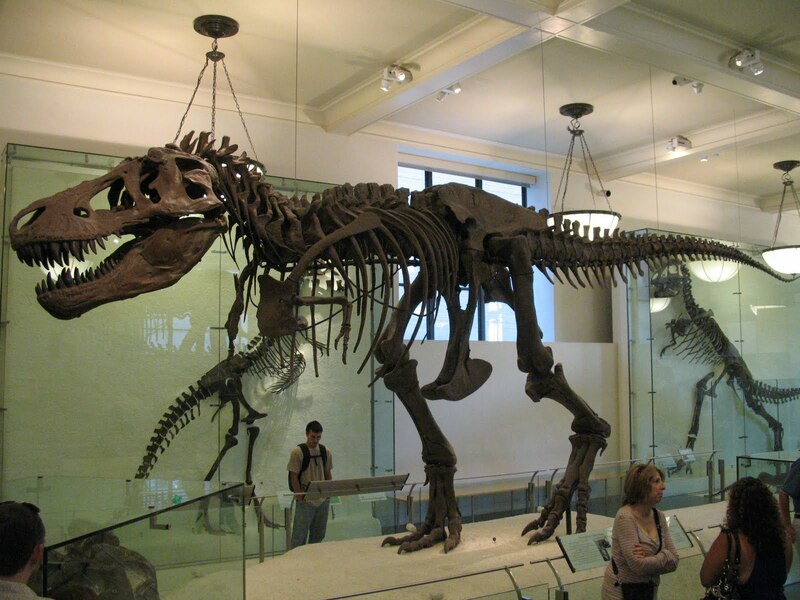 There are many different types of dinosaur tracks here and since it is fossilized it is not known if they were there at the same time. 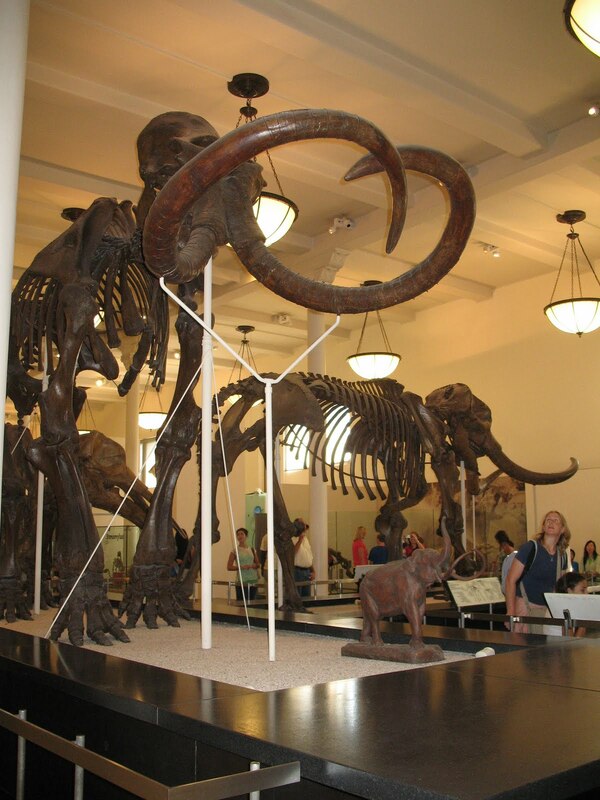 A Mammoth and another early relative of elephants which lived in North America, proboscideans – mammals with enlarged upper teeth called tusks. The only two surviving proboscideans are the Indian and African elephant but there were many more of them in former times, on all continents except Australia and Antarctica. 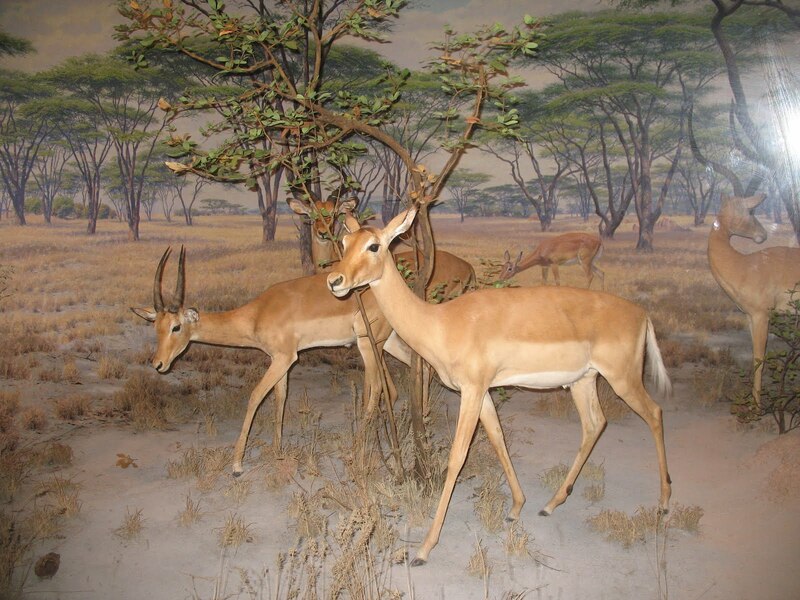 The other area we visited was the Akeley Hall of African Mammals, best known for its fine dioramas, which is the way animals were displayed in museums in former times. They seem quite old fashioned to our eyes today. This two-levelled area of the museum was conceived and executed by Carl Akeley, a skilled naturalist and taxidermist during the 1920s. This new approach to exhibition showed life sized animals in their carefully reproduced native habitat and with a painted scenic background. It was finally opened in 1936 so these are more than seventy years old. All the dioramas are behind glass so it is not easy to take a photo without glare of some kind. 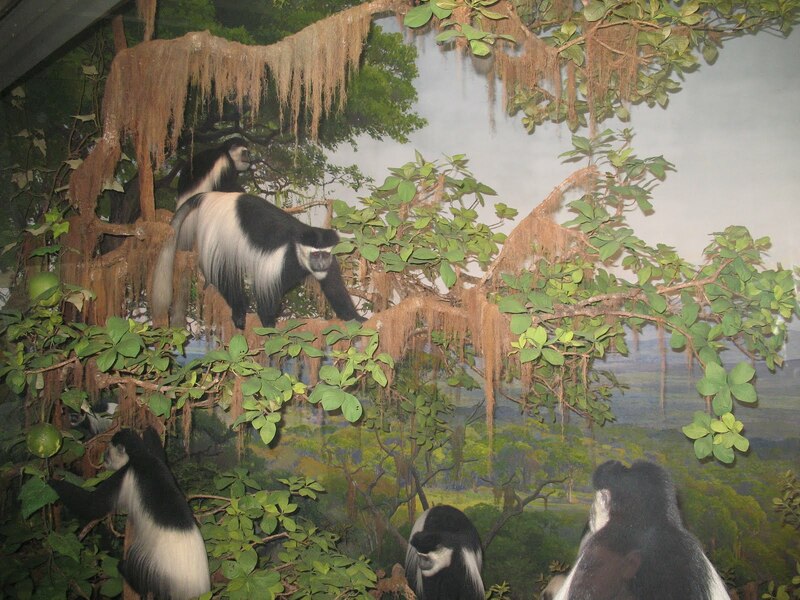 These dioramas are studied today as part of the history and evolution of museums. I can imagine how really revolutionary they were in their day and the amount of research and effort which went into their construction is truly remarkable. This is but a glimpse of a very fascinating museum which I think anyone would find of great interest were they to come to New York, but I think it warrants more than one visit and requires rather a lot of stamina to cover its vast space. I’m away from home for the next few Saturdays but I hate to miss a Photo Hunt. 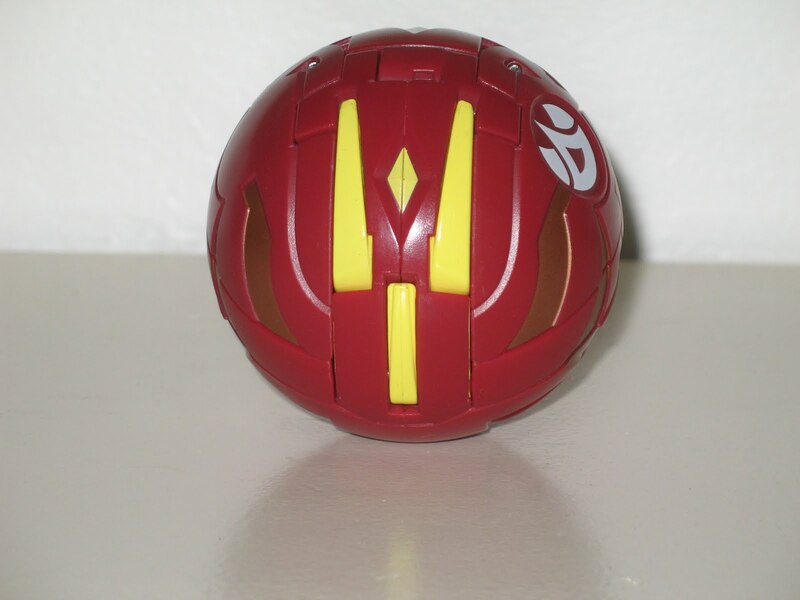 The new obsession with my granddaughter is a game called Bakugan which you may or may not have heard about. 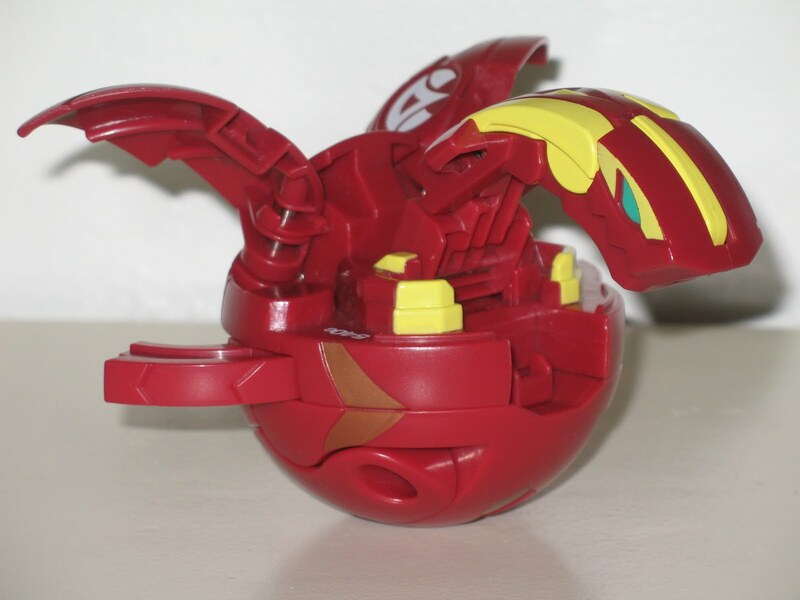 Too complicated to explain in a few sentences, just trust me that this one, a large one, is a dragonoid which just looks like a ball but surprise, surprise, opens into a fearsome looking dragon. They are quite ingenious actually and I am still struggling to learn the winning strategies so that I might have a chance of winning one game against a very competitive six year old. Wish me luck. Open, it does look a bit like a dragon. I had a small epiphany the other day. It was not a nice one to be honest. This is not a comfy post, nor really a hard hat one. I apologise if it is a bit uncomfortable, I am just speaking my mind about bad stuff. I have always thought that most people are basically good and decent and as kind as they are able to be. Deep down I think I have not changed my mind. But not everyone is. And I believe many people who probably see themselves as basically good do terrible evil in the name of some political ideology, religion, or other belief. I am reading a novel just now that involves slavery. I found the description of the raid on one of the main character’s village, the raiders murder of his father. His mother’s desperate attempts to keep his sister and himself together. The terrible voyage, the fact of slavery and what was done harrowing and horrifying. It is not like I don’t know the facts, but it came fully home to me again. We over use the word “realised” I think, but I realised the reality of these things happening, again, and again, in the fairly recent past. “How can people treat other people so terribly?” I wondered. Then I thought of stuff in living memory like the Nazis “final solution”, like so called “ethnic cleansing” that has been going on in different places over the last decade or three. About the unthinkable things the Taliban and other such murderers feel they can justify to themselves, in the name of God too, may they wake up and smell the coffee. And I really “got” that these are only enlightened and civilised times just so long as someone has the muscle and the will to make it so. And something else I thought… How thin is the foundation of what peace and security we have? “It couldn’t happen here” is really just bull we comfort ourselves with. And then I thought thank goodness that there are those who will put themselves in harm’s way to do just that. Our Armed forces and Police Fire and ambulance too I guess. Certainly in some places the Military and the Police are the exact opposite. They are part of the problem that is cruelty, violence and oppression. Does something make those of the “Western world” different somehow? How they think and see themselves maybe. Maybe those who have been influenced by the English speaking world even? I don’t know. And if you think slavery does not happen any more then You are fooling yourself. Think about those poor girls and maybe boys too, but mostly girls who are trafficked as unwilling prostitutes, especially from some of the territories of the former Soviet Union as one example. Now I don’t know, but I think from conversations that the vulnerability you feel towards stuff like this might be greater if you are female, it is more difficult to physically protect yourself without an equaliser. Guys are generally physically stronger and I guess feel deep down they can resist physical compulsion and violence better. When all is said and done in the case of these poor trafficked girls it is male physical force which is a big element in compelling them. We keep stuff like that at bay only as long as we are willing to pay attention and not hide in our comfortable lives. Only so long as we are not willing to permit such things, not willing to acquiesce because it is “expedient” and have not just the willingness but the ability to prevent them. Yes, much to my delight, we were upgraded to Business Class for the flight on Cathay Pacific from Vancouver to New York. This has happened to me only once before, on a leg from Honolulu to Sydney, many years ago. At that time business class brought you larger seats with more leg room, along with extra service, better food and real knives and forks. But lately my flying has been done on Boeing 777-200s and I have wondered what it would be like to travel in the newly designed, rather odd looking seats that are the business class seats provided for these planes. I even briefly flirted with the idea of paying for business class on my trip to Australia but the 9 -10 times greater price figure seemed too outrageous to me so we toughed it out in the economy class for 15 hours. Again, for this trip, I checked it out but the difference cannot be justified in my mind and certainly not for this relatively short flight of 4 hours 40 minutes duration. The Cathay Pacific schedule has recently changed and the Vancouver to New York leg of the flight, which is actually part of a flight from Hong Kong to New York, has morphed into a red eye flight as it leaves at 10.30 pm local time and arrives at 6.55 am, which is not so nice for those who have to travel to meet us at the airport. Each business class seat is its own little entity in this plane, separated one from the other which is just fine for the single traveller but not so friendly for those travelling together. I have always thought the seats rather narrow looking as I have passed through that part of the cabin and having tried one now, I think it would not be especially comfortable for a larger person for a long haul. The wonderful advantage is that the seat turns into an almost fully reclining bed which is quite comfortable for sleeping. Each alcove has its own headphones, personal TV and stowed table. Even before the aeroplane took off, business class passengers were offered beverage service, in this case it was orange juice or champagne and I suppose you could build your own Mimosa by taking one of each, which certainly was fine with the stewardesses as I saw someone do. After takeoff each passenger received a small toilet pack including a pair of socks and a sleeping mask and a menu for the dinner to come. Now it was 11.30pm by this time and dinner was slowly served over the next hour and a half. I’m sorry to say I have no photos of the food as my camera was in my hand luggage above the OS’s seat. I know I should have refused the dinner and taken the opportunity to sleep but I simply had to enjoy all the bonuses which went with this surprise upgrade. Dinner, served on the foldout table set with a placemat and cloth napkin, started with a seasonal salad with Gravlax salmon and a delicious dressing. There was a choice of three different dishes for the main course and I chose butterflied prawns wrapped in bean curd skin and served with fried rice and vegetables. The wine flowed freely however I am teetotal, but the OS enjoyed the choosing from the many on offer. Then followed a cheese plate and fresh fruit or a fruit flan or no doubt all three if desired. The tea and coffee service was interrupted by some pretty wild turbulence and the stewardesses were ordered to their seats for a time. Ultimately it was served later but by this time I had chosen to recline my seat as fully as possible and sleep for the remainder of the flight. Unfortunately this was only for two hours before we landed in JFK airport. There is a lot to be said for business class travel and I certainly would do it if it were more reasonably priced. Even priced up to four times economy class I would be very tempted and no doubt succumb. But eight to ten times seems just too much for me. Now I have talked with many people who travel business class and it is interesting to note that hardly any of them pay the advertised price. Either they are frequent flyers and use points to upgrade or just the evening before we left we had dinner with a couple who said they earned them through charging everything they could on their special airtravel credit cards. So it seems that the few people who actually pay the advertised price are subsidizing others who pay much less for one reason or another. I mean these air travel points schemes started out as a reward for being loyal customers to one airline or another but now you can get free flights by charging a house renovation to your credit card and in fact I know one family who got six free tickets for their family from Canada to England in just this way. It’s no wonder the airlines are losing money hand over fist. I am sure the banks who have these credit cards do pay the airlines money for these tickets but at a highly reduced rate from normal. Frankly I just shake my head as I have no idea how charging completely unrelated items to your credit card really has anything to do with flights on airlines or how it managed to become the way that so many people now pay for their travel. 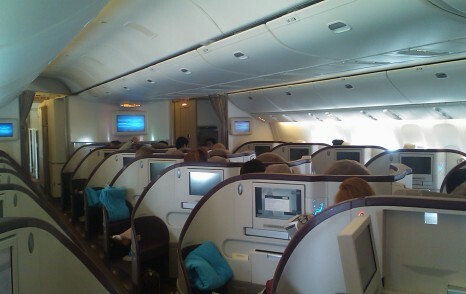 However, I must say that I thoroughly enjoyed the luxury of business class travel which came our way so unexpectedly. So thank you so much Cathay Pacific and if you are looking for volunteers to upgrade again, I would be happy to oblige. New York New York, it’s a wonderful town! I’m off to New York today, on my annual trip to see my daughter and her family. She actually lives just outside of New York City so we have to catch the train into town which is a bit of a hassle. Not the train itself which is just fine, but the fact that it takes an hour and a half to get wherever you want to go. I would like to spend a few days in a hotel in Manhattan, be right in the centre of things, but it is expensive and they usually talk us out of it. The thing is that we don’t get to go to the theatre often, unless we plan a matinée since it is a bit late to travel so far after an evening performance. But I do love New York and I have visited all the wonderful museums and galleries since we first started going there 14 years ago. There is never a shortage of things to do and see in that very vibrant city. So I am sure I will find something of interest to tell you about. We also hope to get to Washington DC again for a few days, to stay with our friends who are spending a year there, lucky things. We spent a five days there a couple of years ago and I have been dying to get back. I never imagined, before I went, how much I would enjoy that town. Of course I knew about the Smithsonian in theory, but it was just so much more in reality. 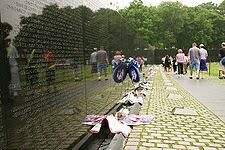 One of the most moving experiences in my life was seeing the Vietnam Veterans Memorial or the Wall as it is more simply known. Watching so many people stand before it, put out their hands to touch some name is just simply overwhelming. People reverently lay things at the base and what an wonderful design treasure it is. I’m not even American but seeing the Declaration of Independence and the Constitution of the United States of America was also a moving experience. So I am looking forward to a foray back to Washington DC, however brief it might be. I know it has been quiet here of late, except for the lunch series and I am sparing you all the rest, except for one at a very special venue, which should be posted soon. Thanks to Miss Moggs who has also been keeping things alive. Back online soon I hope and not only to play Buildabearville, the Second Life for 5-10 year olds, as I call it, with my granddaughter. Joanna Astronaut is my handle there, she says laughingly. Look out for her if you have to venture there with your young ones. So New York, New York I’m on my way. 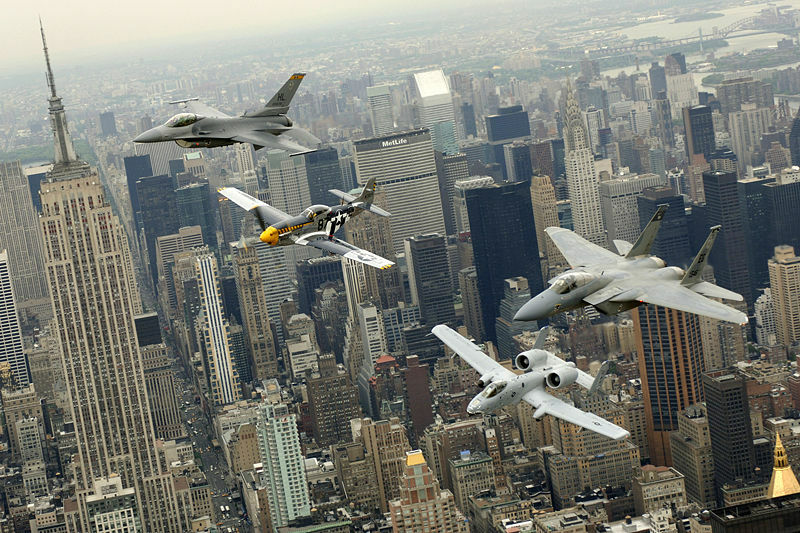 The images above are from Wikimedia commons, the first a military photo and I thought quite interesting. * Song from the 1940s musical and film On the Town. This is an exceedingly loose interpretation of tnchick’s theme for today. Ripples. Well waves after crashing on the beach do peter out finally into ripples on the sand, don’t they? Well that’s my theory and I’m sticking to it. 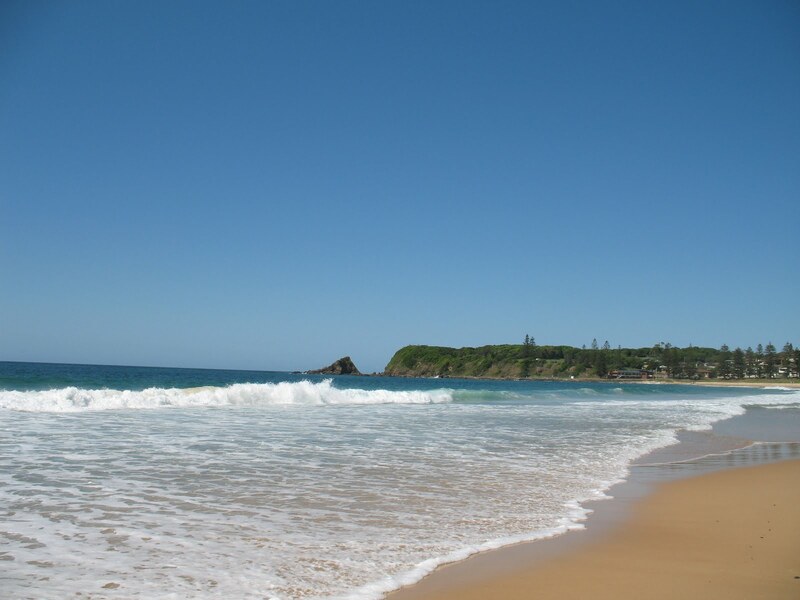 A really beautiful beach, Blackhead, on the north coast of New South Wales, taken on our trip to Australia earlier this year. My sister in law has a second home nearby. 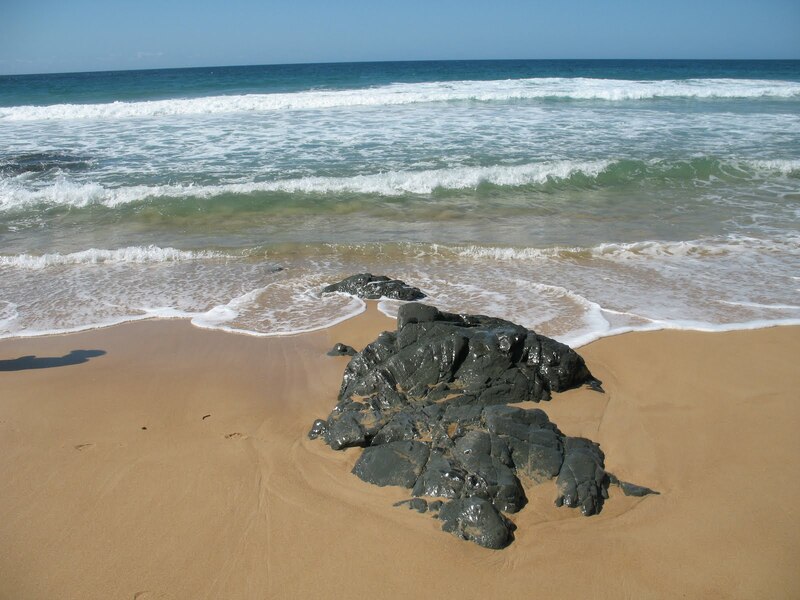 A few ripples which finally lapped this interesting rock formation. My RL Avie set off on the commute this morning. The commute is the price paid for living in the country and working in the city. It was quiet, there was not much traffic about. The river valley was misty. It hung in a layer in the morning air, like a sheet over the world, as if Mother Nature had the decorators in, or maybe the chimney sweep. You could see it rise over the hedgerows and drop a bit into the fields. The first hint of the sun was there painting the purples, blues and pinks with golden yellows and reds. There was a little grain spilled along the highway, at the edge, and the fields were shorn. There were rolls of hay standing in the fields like ancient pagan stones. Then it occurred to me this is the season of mists and mellow fruitfulness that Keats wrote of almost 200 years ago now and I figure he would see it today. The year is on the wane. The crops are starting to be gathered in for another year. Tho’ I noticed the hedgerow blackberries are not at their best yet, you can see hazel nuts that will soon be ready to pick. The rose hips are swelling. Many of the flowers in our garden are working hard doing their thing. And I knew. Soon now there will be harvest festival and the falling leaves as the world dresses in gold and brown and prepares for sleep. And there was I for a brief moment, alone, in sole possession of this wonderful scene and I still feel good about it now.